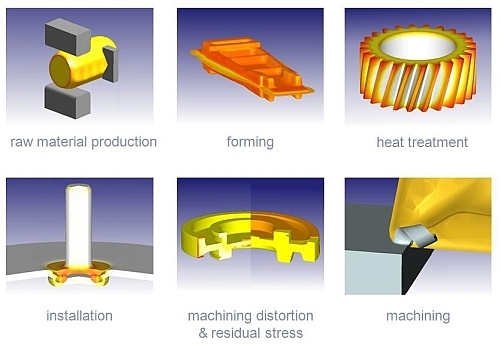 DEFORM™ enables designers to analyse metal and non-metallic forming, heat treatment, machining and mechanical joining processes to improve product quality and reduce manufacturing costs and lead time. Advanced capabilities predict microstructure evolution, phase transformations and product distortion. Advanced simulation capabilities for phase transformation, ductile fracture, micro-structural evolution, machining distortion and chip morphology enables the entire manufacturing chain to be studied – from ingot conversion, through forming, machining and heat treatment, to final product installation. Workflow wizards, with standard material and tooling libraries, support the simulation of typical manufacturing operations with minimum training. Experienced users can also incorporate custom constitutive, fracture and micro-structural models, press specifications and non-metallic materials. DEFORM™ is used by major aerospace, automotive, industrial equipment, bio-medical and nuclear companies together with their supply chain and leading research institutions. DEFORM™ comprises a range of 2D, 3D and process-specific software products to suit the application, together with a Premier bundled option for advanced users and universities. DEFORM™ Forming & Additional Modules offer a range of additional productivity capabilities, including inverse heat transfer coefficient calculations, Design of Experiments and advanced material data prediction. Compared to standard FEA and CFD codes, DEFORM offers significant benefits when simulating large deformation of metals and other materials, particularly when complex contact modelling and mesh rezoning (remeshing) may be required or microstructural changes occur. Typical applications cover forming, heat treatment, machining and material joining processes. Using DEFORM, we estimate that we have reduced the number of samples required by around 50%... The confidence acquired in material volume and raw stock size has consented bulk material purchase giving a great reduction on initial lead times. 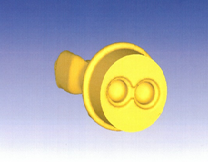 DEFORM 3D is now an integrated part of Cerro EMS’ die design procedure. Manufacturing research is crucial for advancements in quality, production and in reducing the costs associated with the manufacture of parts. Finite element analysis is a powerful tool used to assist this process. DEFORM FE software has been used as a tool to more effectively understand the machining process and additionally the support provided by the James Farrar and his team at Wilde Analysis has always been exceptional. ....our Design Engineers have all been trained by, and worked with, Wilde Analysis to exploit DEFORM more and more....Wilde Analysis has been there over the years to help us make those key steps forward in our FEA capability. Through the years, STANLEY Engineering Fastening’s engineers have experienced many benefits in using DEFORM within product and manufacturing design, rather than simply relying on conventional methods involving trial and error. DEFORM has impressive capabilities and applications; the course is extremely useful!….Within three days you will have the ability to work on real applications. …especially appreciate the time to look at my specific examples & advised me with the right solutions. New and intermediate level users will find this extremely useful to cope with more advanced models and the current expectations in the field of FE modelling of manufacturing operations. A highly informative meeting, showcasing the new developments in software capability... It was the first UGM for me and I really enjoyed it. It is good to see how much support you can get from SFTC... This meeting provided me with a useful update on the new features in DEFORM. The level of support was excellent. My query was dealt with in a speedy and efficient manner with easy to follow instructions which resolved the issue. Thank you. The [technical support] team is very pro-actively engaged in any problem(s) we may have related to hardware or software. Extremely helpful in any way and any level of support. The course was extremely informative & an ideal introduction to the DEFORM Machining Simulation. … Great people, well planned course, informative materials, excellent refreshment, so thank you very much.